Anderson, Kevin J. (ed.). 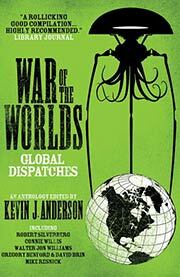 War of the Worlds: Global Dispatches . Bantam/Spectra 1997. Anderson, Kevin J. (ed.). 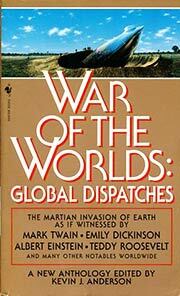 War of the Worlds: Global Dispatches . Titan 2013. Summary: New stories based on the premise that H.G. Wells War of the Worlds was true, to celebrate the centennial of that novel's publication. The more explicitly allohistorical are Kevin J. Anderson's "Canals in the Sand", D. Beason's "Determinism and the Martian War, with Relativistic Corrections", M. Shayne Bell's "To See the World End", Gregory Benford and David Brin's "Paris Conquers All", Barbara Hambly's "Soldier of the Queen", Daniel Marcus's "Blue Period", Daniel Keys Moran and Jodi Moran's "Roughing It During the Martian Invasion, Robert Silverberg's "The Martian Invasion Journals of Henry James", Allen Steele's "A Letter from St. Louis", Mark W. Tiedemann's "Resurrection", Walter Jon Williams's "Foreign Devils" and Dave Wolverton's "After a Lean Winter". Published: Bantam/Spectra 1996 (0553103539BUY), 1997 (0553575988BUY); SFBC 1996; Titan 2013 (1781161747BUY). Translation: Polish by various translators as Echa wojny swiatow , Proszynski i S-ka 1997 (8371807554).